There are thrills and feels but this reimagination of the delightful animation doesn’t take flight often enough. Forget, for a moment, that Tim Burton didn’t actually like circuses as a kid – his heart broke for the captive animals, his throat constricted as trapeze artists somersaulted through the air, his bowels loosened at the glimpse of a clown – and this reimagination of Dumbo seems like the perfect fit. No other Hollywood filmmaker of the last four decades has so championed outsiders and celebrated makeshift families. What’s more, it was Burton’s 2010 billion-dollar-grossing Alice in Wonderland that kickstarted the current wave of live-action takes on Disney’s cartoon classics. Following on from Maleficent (indebted to Sleeping Beauty), Cinderella, Alice Through the Looking Glass, The Jungle Book, and Beauty and the Beast, Dumbo pads out the poignant tale of a parachute-eared pachyderm (the 1941 original was just 64 minutes) by herding the humans front and centre. 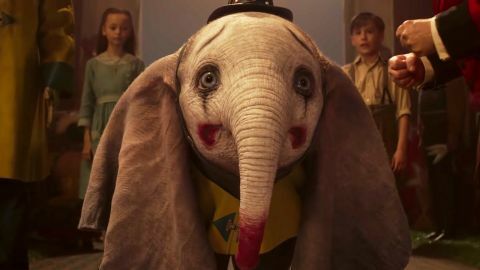 Sure, it still ticks off the key points of the beloved story, with Ehren Kruger’s script finding room for snorted feathers, sorrowful clown paint, and dancing pink elephants, but no longer are events seen through Dumbo’s big, round, glistening eyes. It’s 1919 and the widowed Holt (Colin Farrell) returns from the Great War missing an arm. His two children, Milly (Nico Parker) and Joe (Finley Hobbins), are delighted to see him, but the circus that is their home has seen better days. A trick rider before the war, Holt is appalled to find that ringmaster Max (Danny DeVito) has sold his trusty steeds, and the only job now on offer is shovelling elephant dung. Then the Asian jumbo births a child who has oversized ears which make him the brunt of much cruelty and humiliation. Until, that is, it transpires he can flap those babies to soar up, up and away. Any triumph, though, is short-lived: entrepreneur V.A. Vandevere (Michael Keaton), the owner of corporate theme park Dreamland, comes a-calling with his trapeze-artist lady friend Collette (Eva Green), and soon Dumbo is being used and abused on a grand scale. Of course, when it comes to things of a grand scale, Burton has long been a ringmaster, and the man who puts the ‘ooh’ into kooky and the ‘aah’ into bizarre again demonstrates his preference for grandstanding in-camera sets and effects. The noteworthy exception is Dumbo himself, a CGI creation whose cute factor is high, if not on par with the ginormous pig in Bong Joon-ho’s Okja. In fact, a few soaring sequences aside, Dumbo struggles to maintain altitude. It’s certainly an improvement on many of Burton’s latter-day movies like Alice in Wonderland, Dark Shadows, and Big Eyes, but is, at times, as heavy-footed as an elephant. And grey-faced film fans, like those creatures, never forget, meaning it’s impossible to view this solid family entertainment without pining for the dizzying high-wire acts of Beetlejuice, Edward Scissorhands, Batman, Batman Returns, and Ed Wood. Where has the magic gone, you might ask, especially given the familiar faces of Keaton and DeVito are a constant reminder of better times. It’s only really evident when Dumbo takes to the air to leave all the uninteresting humans below, or when Burton’s subversive sensibilities surge to the fore. For Dreamland read Disneyland, and ponder this: how many Hollywood directors would make a mainstream Disney movie, based on one of the studio’s jewel-in-the-crown classics, that overtly criticises sociopathic corporate greed?